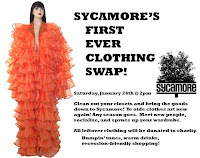 Sycamore, the flower shop that magically transforms into a bar when the planets align (or every evening around 6) is hosting their first ever clothing swap. I'm not really familiar with the concept myself, but apparently you show up with your bags of unwanted clothes, and everyone takes what they want out of everyone else's bag. The rest goes to charity. According to this here flyer, the swap begins at 2pm on Saturday, January 24th (that's tomorrow, folks) and ends when the last pair of courdouroys are swapped or the Genny Cream Ale runs out. Just be sure you don't slip in the mud on the way to the bar, ruining the very pair of pants you were about to swap. Sycamore is located in Ditmas Park, on 1118 Cortelyou Road, between Stratford & Westminster.